During the brisk winter afternoons I like to cozy up in big oversized clothes. My Zara poncho and Gap boyfriend jeans are in heavy rotation. Plus, the poncho is great for bundling up little Lucca when she gets cold. beautiful! large, comfy sweaters are the best when it is wet and cold. Aww, Lucca is so cute! LOVE the poncho! so adorable! LOVE this look! the poncho and the shoes are beyond amazing! Such a cute doggy! I love your bracelet. What an adorable pup...and of course the fashions are adorable too! Love that poncho..great colors for fall/winter!!! What kind of dog is Lucca? She is adorable, and makes me want another puppy. Love the poncho! You pull it off perfectly, so casual yet chic! I love the heels with the laidback poncho! I definitely don't look that good walking my dogs. love the poncho & bf jeans- what a fantastic combo! and the pup is ADORABLE! I wish I had that Zara poncho right now, I'm freezing. Cute outfit! That Zara poncho just looks so cozy. Love it! LOVE the oversized cardi and omg your pup is so cute!!! You look so cute and comfy! Love your boyfriend jeans. Lucca is so darling!! I've fallen in love with your poncho, Taylor! It's fabulous. Also, I like your new web site design. Looks great! This is adorable! So comfy, but it still looks stylish & chic!! Love this look, Taylor! Give me an oversized sweater and boyfriend jeans any day! Lucca is so darling! I hope to see more of her on the blog! 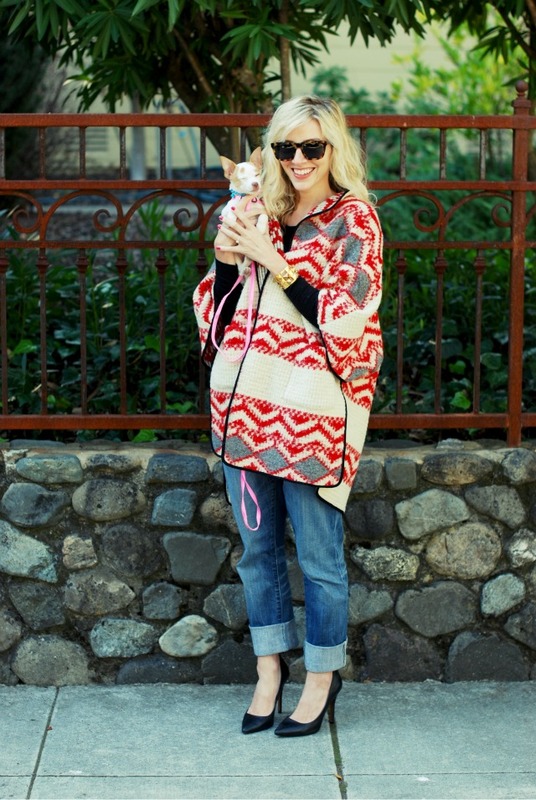 that poncho is super great but that last photo of you and your pup is unbeatable!! Great look!! Lucca is very cute too! Def one of my faves!! PLUS how cute is LUCA!! you make going on for a walk look goooood. great great outfit!! love the outfit! love the puppy even more! what a cutie! Great outfit! That pancho is fantastic and looks warm and comfortable! That last picture is the cutest picture ever! I can't get over Lucca - too cute for words! I don't know whats more adorable, your little dog or the cute poncho.....I am totally loving everything about this post!! Your poncho is so so gorgeous! <3 and I love the shape of your glasses! awesome sweater looks super comfy! You have a beautiful figure. So, anything, even oversized sweaters, look good on you. I am in love with Indian inspired ponchos like this. I have seen so many incredible ones. Def on my Christmas wish list! You look great! Nice poncho! you both look so cute wrapped up in your poncho! most definitely...oversized clothes can be so chic! I keep seeing that cape in Zara and I always longingly look at it, but never have the guts to wear it. Not sure if I could pull it off myself, but it looks great on you! The poncho is the best I've seen yet! And all the pics with your pup make me so happy. That 3 photo is si live and you look amazing even in that oversizes cape/cardi i'm not sure...Pumps are gorgeous, pointed toes are my true passion! love the poncho with pumps :) and Lucca is too adorable! Great outfit!! I've been searching for black pumps recently & was wondering if the pair you're wearing here are comfy> I work in real estate & stylish comfy shoes are a must. Thanks! love the look; the oversized sweater is great! I don't know what I love more: Luca or that gorgeous poncho! wow that poncho looks so snug yet chic. I LOVE your dog. too too cute! i've been wearing tons of orange/red and blue. i love it! just bought these earrings to go with a red mini. I just got a puppy too and am in love! I love seeing your pics of your little guy. I love this print! You look great and vibrant as always! OMG I love that poncho!! I stopped over at Zara.com to purchase this pretty pancho & unfortunately, they were sold out of my size. This would be something I would live in! Thank you for sharing! WOW! GREAT PHOTOS! I LOVE YOUR BLOG! Just saw Vahni wear this so fun to check back to see how you styled it. What a pretty poncho!